HEADING south from Burnie the other day we dropped in for an excellent take away at the popular Caltex at Sassafras and if the tucker we had was a typical sample, we're not surprised they're so popular. 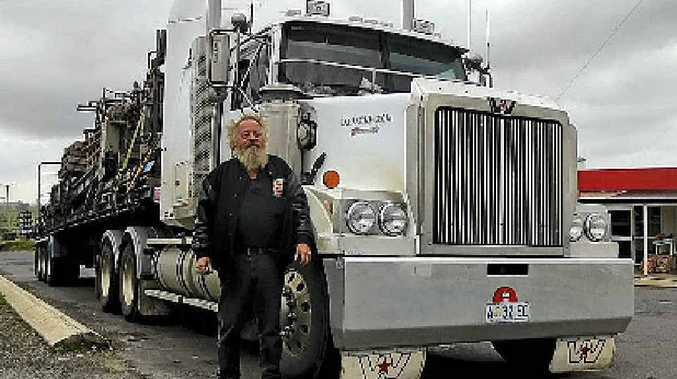 While there, Philip Ashlin from Hobart rolled in driving a Worsley Transport's 2006 Western Star Constellation with a 550 cat up front on his way from Burnie to Launceston and then on to Hobart with a loaded tri-axle flat deck trailer and a mixed load of general freight. Phillip was truly grateful for some hot tucker and a cuppa after spending nearly four hours killing time on the cold and wet docks at Burnie while waiting for the truck. He tells us he has now been with Worsley's for 20 years or so and he finds them to be a good outfit, and says they really look after their drivers, and that that counts for a lot now days.